A Realtor since 2000, Martha moved to the United States from Trujillo Peru in 1992. She arrived in Miami Florida speaking very little English and terrified to be alone in a new country. 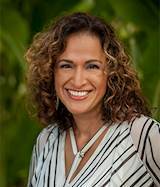 Martha learned the language, developed her professional skills and moved to Maui in 1996 earning her Real Estate Sales license and after many years of successful transactions earned her Real Estate Broker's license in 2008. Martha specializes in the South Maui luxury real estate market. Martha was the South Maui representative for the Realtors Association of Maui. She was instrumental in the Wishing Well Program supplying lunches to school children without means. She also helps the Latin community by translating for those unable to communicate in their daily lives. Sher helps the community with their doctors, attorneys, pharmacists and many more. Martha proudly married Dennis on a very special date of 12/13/14! She shares a loving daughter Jaimie, a great son-in-law Glen and two fabulous grandchildren Morgan & David with her husband. Martha and Dennis love their active lives on Maui in the real estate business along with their daily exercise programs and walking their Lab/Retriever “Angel”! !